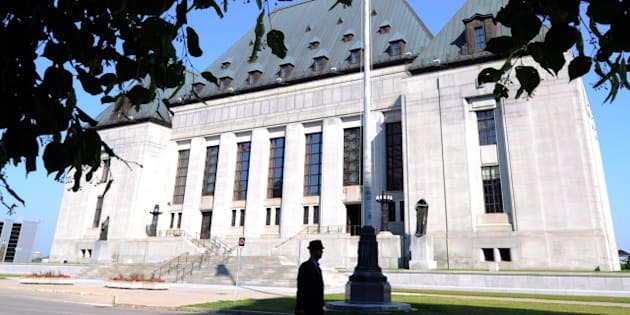 OTTAWA - The Supreme Court of Canada's ruling Friday on a former Congolese diplomat's refugee claim will prevent innocent asylum seekers from being unfairly branded as war criminals, legal experts say. In a precedent-setting 9-0 ruling, the Supreme Court granted the appeal of Rachidi Ekanza Ezokola and ordered a new refugee hearing to determine whether he was complicit by association in war crimes and crimes against humanity committed by the government of his country. The court ruled that a person can only be excluded from refugee protection "if there are serious reasons for considering that he or she voluntarily made a knowing and significant contribution to the crime or criminal purpose of the group alleged to have committed the crime." The ruling clarified the line that defines whether senior public officials should be excluded from the definition of a refugee for being part of a government that commits war crimes. It also shifted the burden of proof needed to deny a refugee applicant to the minister of immigration. The Immigration and Refugee Board, which originally ruled against Ezokola, will now reconsider the case based on Friday's ruling. A "detailed assessment is required to determine whether the particular facts of this case establish serious reasons" to deny Ezokola's claim, said Friday's ruling. "A refugee hearing is not a criminal trial before an international tribunal. International criminal tribunals render verdicts for some of the most serious crimes in the international legal order," justices Louis LeBel and Morris Fish wrote for the court. "In contrast, the board makes exclusion determinations; it does not determine guilt or innocence." The United Nations High Commissioner for Refugees, a intervener in the case, welcomed the ruling. "This is an important judgment for refugee adjudication in Canada and beyond," said Furio De Angelis, the UNHCR representative in Canada. "The Supreme Court of Canada has unequivocally rejected the notion of complicity by association." Lawyer Lorne Waldman, who represented the UNHCR, said the ruling brings Canada in line with the United Kingdom as well as the UN. "There were people who were excluded on the basis of very flimsy evidence, and a very flimsy connection," he said. "Just by reading the jurisprudence, I could probably come up with a hundred cases of people who have been denied. "And that's just the cases that are reported. I'm sure there are hundreds and hundreds." Lawyer Catherine Dauvergne, who represented the Canadian Council for Refugees, another intervener, cited several examples of refugee claimants unfairly rejected by Canada, "and wrongly stigmatized as war criminals." They included a lowly desk clerk with diplomatic credentials, a journalist forced to publish propaganda for the banned Tamil Tigers terrorist group in Sri Lanka and a typist who worked for her country's security service who leaked information about human rights abuses. "It was a long overdue and much needed reset for Canadian law in this area," said Dauvergne, a University of British Columbia law professor. Nothing in Friday's ruling will prevent authorities from discovering legitimate criminals and denying them refugee protection, she added. Ezokola was the second in command at the Democratic Republic of Congo's United Nations embassy in New York. He fled to Canada with his wife and eight children in 2008 after a falling out with his ambassador because he no longer supported the re-election of President Joseph Kabila. He feared he would be accused of treason, and claimed Congo's intelligence service "harassed, intimidated, and threatened him," said the ruling. Ezokola had been a government bureaucrat since 1999 and was appointed to his country's UN mission in 2004. Ezokola's lawyer, Annick Legault, said her client was delighted with Friday's decision. Legault said it would likely take months before a new hearing was scheduled, but in the meantime Ezokola would be keeping a low profile. She wouldn't say where in Canada he is currently living. "I think that this whole ordeal has been a lot for the family. It's important to protect them," she said. The high court's ruling, she said, will clarify the way forward for lawyers representing clients like Ezokola in the future. "It was difficult even for the lawyers taking care of these cases to know what we would have to do, the burden that needed to be met," she said. "Now the minister will have to provide much more significant evidence in order to meet their burden to exclude people. It's important to take this seriously and not exclude people lightly." Note to readers: This is a corrected story. An earlier version misspelled Joseph Kabila's last name.